Having received a favourable response from Amritsar and Patiala, the Punjab government has asked all Deputy Commissioners of the state to consider introducing eco-cabs in their districts. In an affidavit produced by Advocate Sudeepti Sharma, law officer for Punjab, the state today submitted that all the DCs of the state have been given three months' time to consider this and submit their reports. The Punjab Heritage and Tourism Promotion Board has decided to forward the project report submitted by the Graduates Welfare Association, Fazilka, an NGO which had initiated eco cabs, to all the DCs. DC Amritsar and DC Patiala have intimated that the scheme (launch of eco cabs) can be covered under the differential rate of interest scheme of RBI under which only four per cent interest is charged from beneficiaries. DC Amritsar has intimated that each rickshaw cab costs around Rs 11,256, the beneficiary shall be contributing only Rs 500. "All the DCs can get in touch with DC Amritsar for getting the requisite number of Eco rickshaw cabs being made available at the said price. All the DCs shall complete this exercise within three months. Punjab Heritage and Tourism Promotion Board shall also extend monetary help to the DCs wherever it is needed for the smooth launch of this scheme," the affidavit states. Taking the affidavit on record, a division bench comprising Justice Surya Kant and Justice Ajay Tewari today directed the government to file a status report after three months. Also the High Court has asked Haryana government and UT Administration to convene a meeting to consider as to whether eco cabs can be introduced in Haryana and Chandigarh also. FEROZEPUR: Even after expiry of the one-month deadline set by chief minister Parkash Singh Badal to examine the issue of restructuring districts and declaring Fazilka as one, at the time of constituting Sukhbir-Kalia committee, nothing has happened. In absence of any concrete action by the government, which promised to accord district status to Fazilka by March 31, various social, religious and labour organizations have planned a series of agitations to mount pressure on the government. Sushil Gumber, president of Sanjha Morcha, said if the government failed to make an announcement by month-end, the body would launch a people's stir. Earlier, the 150-day stir, spearheaded by the morcha, was called off on January 8, after Punjab forest minister Tikshan Sud assured that Fazilka would be made a district by April-end. Local BJP legislator Surjit Jiyani, who along with Charan Singh, circle president, SAD, went on fast-unto-death at the Clock Tower for a few days in January, had ended their protests following Sud's assurance. Though Surjit Kumar Jiyani, local BJP MLA claimed that the state government would keep its promise, political experts pointed out that denial of district status to Fazilka would adversely affect the image of BJP. Local bodies minister Manoranjan Kalia, who is heading the committee along with Sukhbir Badal, said they had held a couple of meetings in the last few months to discuss restructuring of districts. ''We are hoping that something positive will emerge during the next meeting, which would be convened once Deputy CM Sukhbir Badal returns from abroad,'' he said. NEW DELHI: Official talks on Turkmenistan, Afghanistan, Pakistan and India (TAPI) gas pipeline project began discussing gas sales and other details of the $7.6 billion project but are unlikely to conclude any agreement at the end of four day talks, Press trust of India PTI reported on Tuesday. India is hosting the high level talks, which among other things, is to deliberate on a Gas Sale and Purchase Agreement (GSPA) and project structure. "The four-day talks began Monday and will continue till April 28. An official communique is likely to be issued at end of talks on Thursday," an official said. Technical Working Group (TWG) on TAPI project are holding meetings on the first three days and steering the committee of to meet on April 28 which will be attended by the Oil Ministers of Turkmenistan, Afghanistan, Pakistan and India. However, GSPA is unlikely to be finalized in these talks and the four nations may agree for another date for holding further discussions. "GSPA was originally to be concluded by April end but it looks unlikely. The deadline is likely to be extended till July 31," another official said. The talks will focus on the proposed appointment of Transaction Advisor for assisting in forming a consortium which will lay and operate the pipeline. It will also raise funds for TAPI gas pipeline project after signing of GSPA. The four countries, which had in December signed Inter-Governmental Agreement (IGA) and Gas Pipeline Framework Agreement (GPFA), have decided to jointly form a consortium for the pipeline and the consortium will be headed by an international company having similar experience. TAPI project envisages 1,735 km pipeline with total gas capacity of 90 million standard cubic meters per day. It will run from Turkmenistan's Yoloten-Osman gas field to Herat in Afghanistan and through southern Afghanistan province of Kandahar before entering Pakistan where it will reach Multan via Quetta before ending at Fazilka in India. On completion, India is expected to receive 38mmscmd of gas through the pipeline. The project was initially planned to be completed by end of 2014, but the deadline has now been revised to mid 2016. Discussions will revolve around having uniform price of gas for all three of the importing countries. As per plan, 38 million standard cubic meters per day of gas would go to India and Pakistan each while 14 mmscmd would be bought by Afghanistan. FEROZEPUR: The laboratory analysis of water samples drawn from different schools, both government as well as private falling under Ferozepur district recently, indicated that water being consumed by thousands of students was not fit for consumption. The latest laboratory analysis of water samples has once again focused attention on the fact that drinking water in most of the Malwa belt is unfit for human consumption. The growing number of cancer cases in this part of the region is generally attributed to chemical-laden drinking water. A team from the health department had collected nearly 105 water samples from schools across the district last month, of which nearly 60% samples failed the test. Rajinder Kumar Gagneja, assistant unit officer, health department, said water samples collected from various private schools, including Mata Gujri School and Akal Academy School in Bhadana village, Holy Heart Day Boarding Public School, Atmavallabh Public School and Sarv Hitkari Vidya Mandir School in Fazilka, have failed the test. Likewise, water samples collected from government primary schools in Jandwala Bhimeshaha, Manawala, Tilewala, Guru Har Sahai, Chak Wairo Ke and government elementary school in Mothiwala were also found impure. Besides, one water sample taken from the water works tank in Chandeed village in Ferozeshah block also failed quality test, he informed. Health officials say these are worrying signs as the summers are on and there is a threat of water-bourn diseases among the students. However, there is a complete lack of communication between health department and education department. The officials of the education department said they had no information regarding this matter. 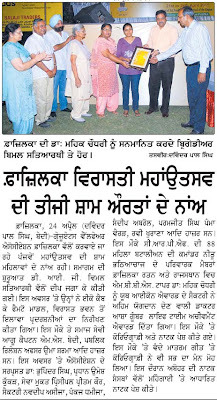 The Graduates Welfare Association, Fazilka, (GWAF) would organise the fifth 'Fazilka Heritage Festival-2011' from April 21 to 24 with association of the Punjab Heritage and Tourism Promotion Board at the local Sanjay Gandhi Memorial Park (Pratap Bagh) and at historical Clock Tower. 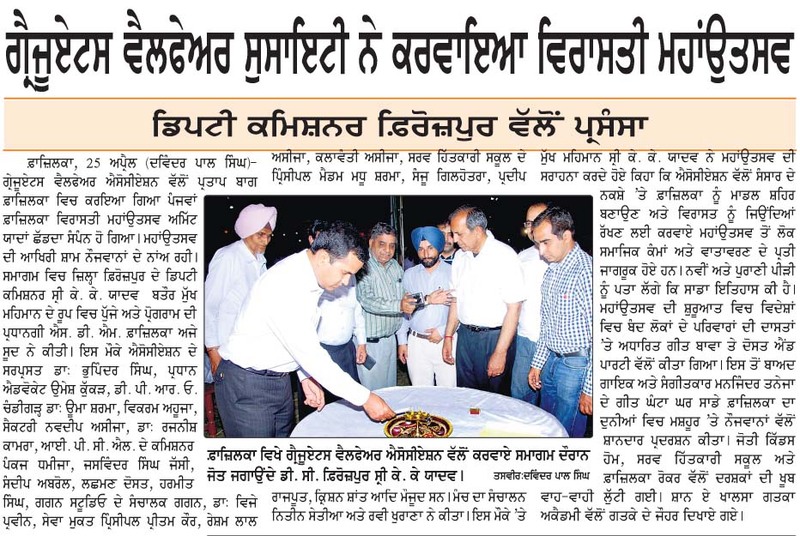 Association President Umesh Chander Kukar said an annual Art, food and culture festival would be designed on scientific theme 'Clean and green Fazilka'. Brig Arul Dennis would inaugurate the festival. 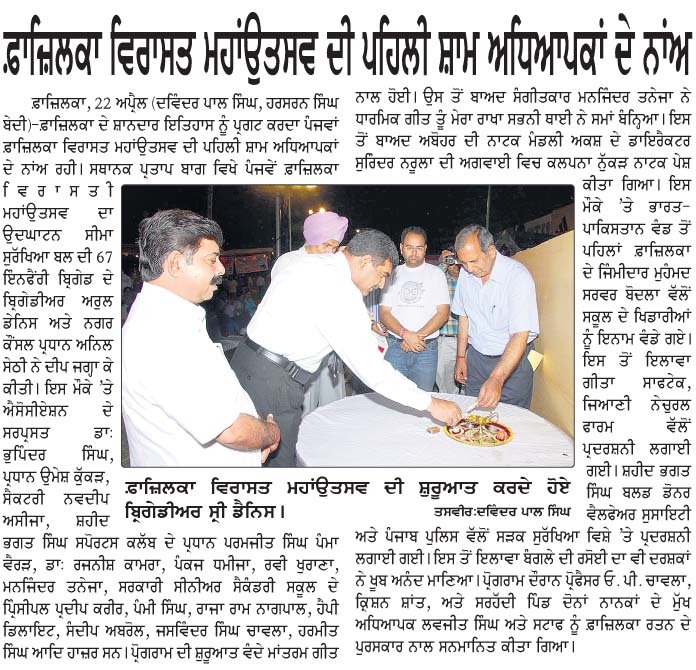 The main highlight of the Fazilka heritage festival this year would be special nights dedicated to teachers, children, women and youth. On April 21, the dedicated teachers, on April 22 adorable kids, on April 23 women achievers and on April 24, the youths, who had brought laurels to Fazilka, would be honoured. The famous Clock Tower would be decorated during the festival. "Besides promoting the vibrancy of the culture of the border town, the event would also help in establishing Fazilka as a brand city," said GWAF patron Dr Bhupinder Singh and general secretary Navdeep Asija. During the festival, rock show, Bangla Theatre, sham-e-ghazal, folk dances, shopping, Fazilka virasat bhawan, books and art craft exhibition would be displayed. Punjab Chief Secretary SC Aggarwal inspected the project connected with removal of waterlogging by adopting an Israel-based model, which was being run by the public-private organisations at Shajrana village of this subdivision, late last evening. The project was being jointly executed by the Punjab Agro Industries Corporation Limited (PAIC), a state government organisation, Sampuran Agri Ventures, Fazilka, a unit of food-processing company Nasa Agro and Kirloskar Group. Under the project, water bodies would be created over the land, which had turned waste due to waterlogging, to make the saline water flow in it, creating crystals of sodium, cleaning the water for agriculture and drinking purpose and ,subsequently using the surplus water for production of fish. Aggarwal, while speaking at the function, said this was the new model of tackling waterlogging in the region, which had become a major problem for the farmers for the past many decades. Aggarwal, who was accompanied by senior functionaries of different departments of the state government, said the Punjab government had been taking care of each and every problem of farmers and were trying to remove it in a phased manner. He said if the project produced desirable results, it could be used for solving the waterlogging problems in other areas of Punjab. Deputy Commissioner KK Yadav said Aggarwal also interacted with the farmers of Shajrana village to know as to whether the project was acceptable to them or not. He added that the project was being implemented in about 400 acres of land at the village, which was waterlogged, and it had already been approved by the Punjab government. Sanjeev Nagpal, MD, Sampuran Agri ventures, Fazilka, said the project was a befitting answer to the problem of waterlogging in the Malwa region of Punjab. The concept could be used to make 1.25 lakh hectares of waterlogged areas in the south-west Punjab useful for fish farming, dairy farms, orchards, food-processing industry, packaged drinking water, biogas and power generation. The concept of Kissan Uthaan was developed when a delegation, led by Chief Minister Parkash Singh Badal, went to Israel in July 2009 and saw how the wasteland was being converted into water reservoirs and agro-processing was integrated with power generation, he added. Meanwhile, a section of the farmers of the region urged Aggarwal for providing them electricity connection for tubewell motors on priority basis. Fazilka, April 15 : During his one day visit to Fazilka, Chief Secretary Punjab Mr S.C. Aggarwal inaugurated "Fazilka Femto", a year 2011 model of Fazilka Ecocab. 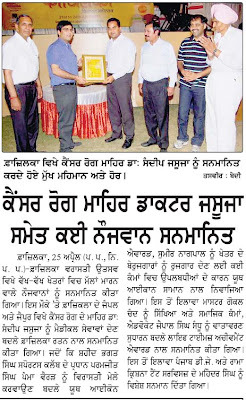 This is the third model being launched in the same series by Graduates Welfare Association Fazilka (GWAF). 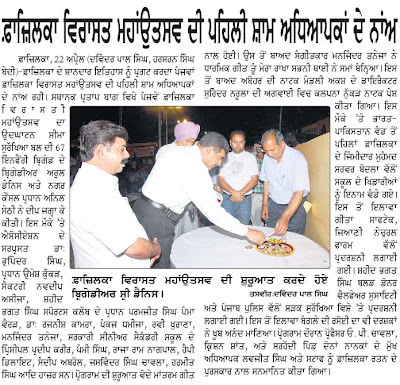 Last year on the occasion of Fazilka Heritage Festival, Ecocab model "Fazilka Nano" was launched. "Fazilka Femto is a further modified version of "Fazilka Nano" including certain additional features like detachable canopy, modified suspension system and canvas based sitting area made it suitable for rural roads", said Dr Bhupinder Singh, Patron, GWAF and designer of Fazilka Femto. New model launched at "Shaheedo Ke Samadh- Asafwala War Memorial on Indo-Pak border, 6 km from Fazilka city. 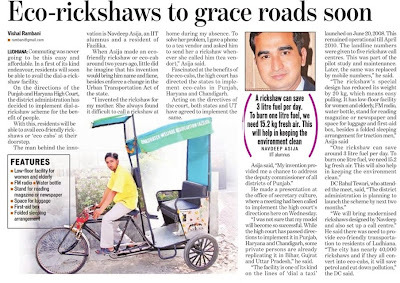 It is important here to mentioned that Fazilka has been ranked first city in the world, where cycle rickshaw is being made available via phone call. Later after on one of the news item appeared in an English daily, Punjab and Haryana High Court took suo-motu action and ordered the governments of Punjab, Haryana and Chandigarh to implement the same "Fazilka Ecocab" concept in the entire state. More than 6 lakhs rickshaw families are going to get benefit out of it. Sharing about the success of "Fazilka Ecocabs", Navdeep Asija, Secretary (Admin), GWAF mentioned that "Our small social engineering experiment at Fazilka resulted big output, we are pioneered the rickshaw revolution in northern India and now each stakeholder is thinking about it seriously". Last month Punjab government has already ordered to all deputy commissioners to implement "Ecocabs" in their respective jurisdictions within three months and progress report is also sought on the same. Last week, Prof Rajat Aggarwal, Department of Management Studies, IIT Roorkee visited Fazilka to study the concept of "Fazilka Ecocab" and he is keen to implement the same at IIT Roorkee. Going by an overwhelming response from the people and rickshaw-pullers in Amritsar, Patiala and Fazilka, the Chief Secretary, SC Agarwal, has shot off letters to all Deputy Commissioners of the state, directing them to explore the possibility of introducing the eco-rickshaw cab scheme, in their respective districts. The highlight of the scheme is that people get the rickshaw service on a telephone call at nominal rates. Besides, the eco-rickshaw cabs are equipped with FM Radio sets, first-aid kits and the rickshaws are made of metal only. The letter, written to the DCs by the Chief Secretary, reads, "Since the district tourism promotion council, Amritsar, and DC, Ferozepur, have reported that the eco-rickshaw cab scheme has received a positive response, you are requested to explore the possibilities and step further in implementation of the eco-rickshaw cab scheme in your district." Notably, in 2008, Fazilka got the distinction of being the first district of the state, wherein an initiative of providing eco-friendly bicycle rickshaw service to the people, was taken by the Graduates' Welfare Association of Fazilka, in collaboration with an NGO. Later, in October 2010, an NGO, Patiala Foundation, launched this service in the royal city of Patiala. Thereafter, the service was launched in Amritsar by the district administration, in collaboration with the Tourism Department. Fazilka, the cotton-rich town of Punjab bordering Pakistan, which has carved a niche for itself in different fields, will add another feather to its cap on April 16, 2011, when it will join the league of 40 big cities, which are available via open street digital maps. This border town, which has suffered huge losses on account of the 1965 and 1971 Indo-Pak wars, has already attracted the attention of countrymen for its handmade juttis (footwear), tosha (a sweet), first car free zone, dial- a-rickshaw service and for starting different projects connected with environmental conservation. "In the era of technology, local Graduates Welfare Association Fazilka (GWAF) has joined hands with Guru Nanak Dev Engineering College, Ludhiana, to prepare a digital map of Fazilka and make it available to public through Internet," said Navdeep Asija, Secretary (Administration), GWAF. The project is called Open Street Map. Through unrestricted access to data, such digital maps will empower the citizens and will result in numerous innovations. The project will help the government and NGOs in their social welfare schemes by providing geographical information for their projects. different sections, who would be having a GPS device to capture the ground realities, land marks, eating outlet, hotels, restaurants, and other related attributes as a part of the mapping party. "The information collected by them will be combined and uploaded. Geeta Softech, Fazilka, will be acting as a facility provider. The concept is fairly new to India and is fast catching up, said Vinod Kumar, Director, Geeta Softech, adding that information will be available on the website http://osm.org. "Fazilka city is one of the hot spots in border area tourism in the Malwa region of Punjab for its original art and culture, rural tourism, black buck sanctuary and border retreat. Such information on a digital map will help visitors at large," he claimed. 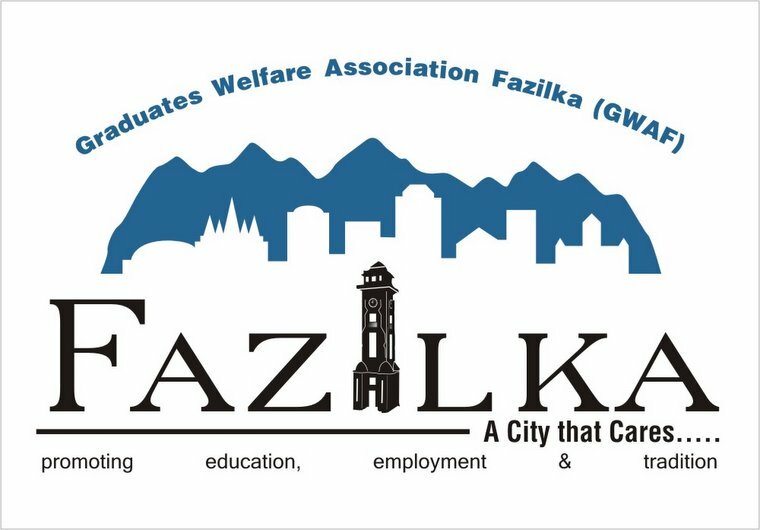 Keeping up with the technology era, Graduates Welfare Association Fazilka (GWAF) have joined hands with Guru Nanak Dev Engineering College (GNDEC), Ludhiana to prepare a digital map of Fazilka and make it available to the public, through the Internet. The effort is aimed at promoting tourism in this town. Fazilka will thus be the first among tier-II cities to have a digital map, claimed GWAF authorities. GWAF and GNDEC's joint efforts will place India's smallest big town actually on Global Map network. Geeta Softech would be the local host to conduct the map party event for the same. Project mentor, Prof (Dr) HS Rai enumerated the advantages and benefits of a digital map. Prof Rai explained, "The project is called Open Street Map. Open street maps are free editable maps made with the help of the GPS by anyone at anytime. These maps allows us to view, edit and use geographical data in a collaborative way from anywhere on the globe. Through unrestricted access to data, such digital maps empower the citizens, ultimately resulting in numerous innovations." Further emphasizing on the concept of a digital map and map party, he informed that this project will help the government and the NGOs in their social welfare schemes, to provide them geographical information for their projects. It will also promote tourism of this small border town. Giving further details about the event, Navdeep Asija, Secretary (Admin), GWAF informed, "We have selected 20 people belonging to different domains, like draftsmen, farmers, people from defence services, budding civil engineering and architecture students and map lovers; each one will be having a GPS device to capture the ground realities, landmarks, eating outlets, hotels, restaurants, and other related attributes as a part of mapping party, further information obtained by all shall be combined and uploaded." Geeta Softech Fazilka would be acting as a facility provider. "There are hundreds of active mappers today, but since the concept is fairly new to India, it is fast catching up, and we are happy to associate ourself with the great cause for our city beautiful," said Vinod Kumar, Director Geeta Softech. Interestingly, all data generated will be available in public domain, which may be used by anybody, the way they like, without bearing the burden of any charge. The information will be available on the website http://osm.org . Fazilka city is one of the hotspots on the border area for tourism in the Malwa region of Punjab, for its original art and culture, rural tourism, black buck sanctuary and border retreat. Such information will help visitors at large. And in the era of technological advancement, it is a welcome step, said Dr Bhupinder Singh, Patron GWAF. Free training shall be given and each participant will be honoured with Certificate of Appreciation, he added. Fazilka is famous for its handmade jutti, sweet treat-Tosha, dial-a-rickshaw concept and much more. After attaining the many first status in the India and Worldwide because of its handmade Jutti, Tosha, 1965-1971 India Pakistan War, dial-a-rickshaw and the latest India's first Car free city, this coming Saturday one more star would be added to the name of Fazilka. Fazilka would join the league of first 40 big cities available via open street Digital Maps online and first in the tier II towns of the country. 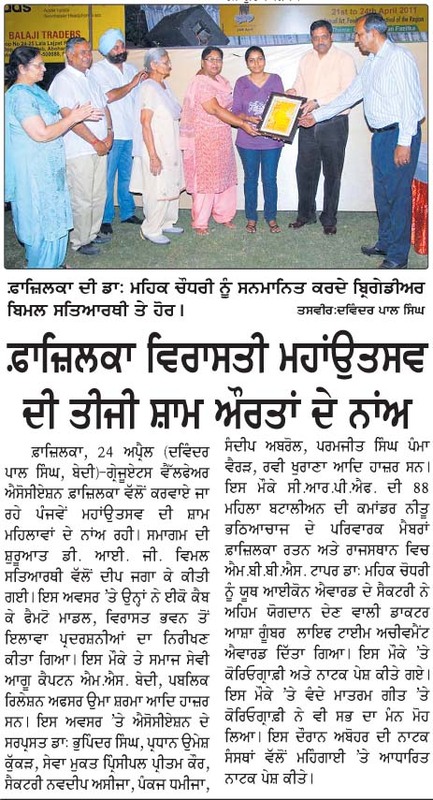 In the era of technology, Graduates Welfare Association Fazilka (GWAF) joins hands with North India's technical giant Guru Nanak Dev Engineering College (GNDEC), Ludhiana to prepare digital map of Fazilka and making it available to public, through Internet, as their own map. A map created by public, for the public, and owned by public. The GWAF and GNDEC's joint efforts will make India's smallest big town actually on Global Map network. Geeta Softech would be the local host to conduct the map party event for the same. Talking to media persons project mentor, Prof (Dr.) H.S Rai enumerated the advantages and benefits of digital map. Prof. Rai explained "The project is called Open Street Map. Open Street maps are free editable maps made with the help of the GPS by anyone at anytime. These maps allows us to view, edit and use geographical data in a collaborative way from anywhere on the globe. Through unrestricted access to data, such digital maps empower the citizens, ultimately resulting in numerous innovations." Further emphasizing the concept of digital map and map party, he informed that this project will help the Government and NGOs in their social welfare schemes, to provide them geographical information for their projects. It will also promote tourism and help journalists and students a lot. "The quality data so produced will also facilitate easy navigation for commuters. It is very useful for a small town like Fazilka, has its presence on global map; due to its environment related activities in the recent past and world like to know more about it. Giving further details about the event, Navdeep Asija, Secretary (Admin), GWAF informed, "we have selected 20 people belonging to different domains, like draftsmen, farmers, people from defence services, budding Civil Engineering Architecture students & map lovers, each one will be having a GPS device to capture the ground realities, land marks, eating outlet, hotels, restaurants, and other related attributes as a part of Mapping party, further information obtained by all shall be combined and uploaded". Geeta Softech Fazilka would be acting as facility provider." There are hundreds of active mappers today, but since the concept is fairly new to India, is fast catching up, and we are happy to associate our self with the great cause for our city beautiful", said Mr Vinod Kumar, Director Geeta Softech Interestingly, all data generated will be available in public domain, which may be used by anybody, the way one likes, without bearing the burden of any charge. The information will be available on the website http://osm.org . 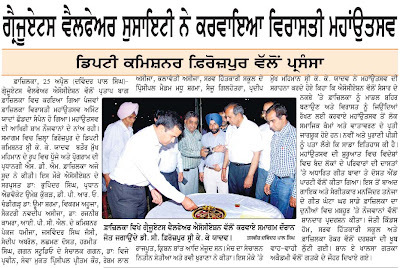 Fazilka city being one of the hot spot on border area tourism in the Malwa region of Punjab, for its original art and culture, rural tourism, black buck sanctuary, border retreat, such information will help visitor at large, and in the era of technological advancement, it is a welcoming step, said Dr Bhupinder Singh, Patron GWAF. Free training shall be given and each participant will be honoured with Certificate of Appreciation. Commuting was never going to be this easy and affordable. In a first of its kind endeavour, residents will soon be able to avail the dial-a-rickshaw facility. On the directions of the Punjab and Haryana High Court, the district administration has decided to implement dial-arickshaw scheme for the benefit of people. With this, residents will be able to avail eco-friendly rickshaws or `eco cabs' at their doorstep. The man behind the innovation is Navdeep Asija, an IIT alumnus and a resident of Fazilika. When Asija made an ecofriendly rickshaw or eco-cab around two years ago, little did he imagine that his invention would bring him name and fame, besides enforce a change in the Urban Transportation Act of the state. "I invented the rickshaw for my mother. She always found it difficult to call a rickshaw at home during my absence. To solve her problem, I gave a phone to a tea vendor and asked him to send her a rickshaw whenever she called him (tea vendor)," Asija said. Fascinated at the benefits of the eco-cabs, the high court has directed the states to implement eco-cabs in Punjab, Haryana and Chandigarh. Acting on the directives of the court, both states and UT have agreed to implement the same. Asija said, "My invention provided me a chance to address the deputy commissioner of all districts of Punjab." He made a presentation at the office of secretary culture, where a meeting had been called to implement the high court's directions here on Wednesday. "I was not sure that my model will become so successful. While the high court has passed directions to implement it in Punjab, Haryana and Chandigarh, some private persons are already replicating it in Bihar, Gujrat and Uttar Pradesh," he said. "The facility is one of its kind on the lines of `dial a taxi' launched on June 20, 2008. This remained operational till April 2010. The landline numbers were given to five rickshaw call centres. This was part of the pilot study and maintenance. Later, the same was replaced by mobile numbers," he said. "The rickshaw's special design has reduced its weight by 20 kg, which means easy pulling. It has low-floor facility for women and elderly, FM radio, water bottle, stand for reading magazine or newspaper and space for luggage and first-aid box, besides a folded sleeping arrangement for traction men," Asija said "One rickshaw can save around 3 litre fuel per day. To burn one litre fuel, we need 15.2 kg fresh air. This will also help in keeping the environment clean." DC Rahul Tewari, who attended the meet, said, "The district administration is planning to launch the scheme by next two months." "We will bring modernised rickshaws designed by Navdeep and also set up a call centre." He said there was need to provide eco-friendly transportation to residents of Ludhiana. "The city has nearly 40,000 rickshaws and if they all convert into eco-cabs, it will save petrol and cut down pollution," the DC said. Three members of a family including the 60-year-old man, his wife and son were arrested by the sleuths of the Border Security Force (BSF) when they were smuggling two kg of heroin from across the cobra fencing. Information gathered by TNS revealed that these three members of the family, whose names were not being disclosed by the BSF authorities to avoid any problem in the investigation of the case, were bringing the two packets, containing one kilogram of heroin each, in the battery of the tractor, which they used for agricultural operations. Vimal Satyarthi, DIG, BSF, Abohar, when contacted, while confirming the seizure of the narcotics, worth Rs 10 crores in international market, said the accused had emptied the battery of the tractor by draining out its water. After emptying the battery, the accused had inserted two packets of heroin in it to avoid detection by the BSF sleuths. He said that as the BSF jawans patrolling the area had been alerted apprehending mischief by elements across the Radcliffe line, taking advantage of the considerable height of wheat and other crops, grown in close vicinity of the Indo-Pak border, they carried out intensive checking of the tractor and managed to find out the narcotics. He said that all the accused were taken into custody near Bhaini Gulaba village, which is located near the international border and fell under the Gorkha Gatti (GG) border observation post (BOP). The sleuths of the 199 Battalion of the BSF had made this seizure. "Last year, the alert BSF sleuths managed to unveil a modus operandi of the smugglers in which they were trying to smuggle narcotics by creating a special cavity in their bullock cart," pointed out Satyarthi, adding that the BSF jawans had been asked to inensify the checking of people and vehicles, which moved in the area, located close to the international border. The DIG said the police authorities concerned had been approached to register a criminal case in this connection. The questioning of these accused was expected to reveal useful information in connection with the new modus operandi, being adopted by the smugglers. The Punjab tourism department is planning to set up a museum to showcase the "evolution" of rickshaws during the past 130 years since they have been around in India. The museum will be one of its kind as there is no single museum in the world solely dedicated to this eco-friendly, human powered means of transport. The initiative to set up the museum has been taken up by the department in collaboration with Graduates Welfare Association Fazilka (GWAF), which has pioneered the eco-cab movement in the state. The GWAF's eco-cab is an improvement upon the traditional rickshaw, and is about 20 kgs lighter. Now, the department is scouting for the land to set up the museum. The photo gallery will exhibit historic pictures related to rickshaws, like Mahatma Gandhi's visit to the Shimla convention on a rickshaw. The third section, the literature section, will display books and contain CDs of movies which majorly featured rickshaws, with audio-visual aids. Navdeep Asija, secretary of GWAF, said globally, there is now more and more interest in this environment-friendly, sustainable transport. "Rickshaw has been part of our collective heritage. We must acknowledge its growth and socio-economic value through such initiatives," he said. 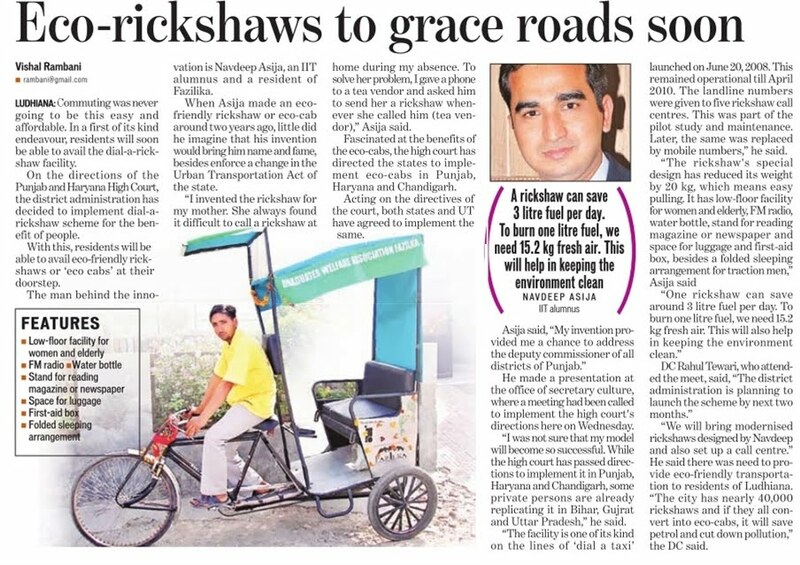 Heritage rickshaws for the project will be sourced by Delhi-based rickshaw-manufacturer Sandeep Arora. Modern factories now churn out about 20 rickshaws in a day. Arora, whose father was in the same business, recalls the time when it would take a month to make a rickshaw, with all the woodwork and the artwork. Arora has managed to get two 70-year-old rickshaws from Shashi Bhushan Sharma, whose father used to run the Sevak Cycle-Rickshaw Cooperative Industrial Society in Delhi in 1960. "At that time, there were only about 850 rickshaws in the whole of Delhi, and rickshaw tyres were provided on ration cards. Many years ago, I had dismantled and kept two of these rickshaws for the sake of nostalgia. I will happily give them for the museum," said Sharma. Arora plans to source other models from Meerut, Kolkata, Moradabad and other old cities, through his trade network. "As far as possible, we will try to get the originals, and where it is not possible, make a copy," he said.